Doubt About It: When Would You Want To Be Born? Really crummy football weekend. Steelers lose, Nittany Lions lose, and my juggernaut fantasy football team lost its first game of the year. Disappointing all around. I'm trying to convince myself that the Cardinals victory was more of a victory for Western PA football, as my grandfather's favorite high school player of all time, Steve Breaston, essentially won the game. The good news: the healing process can begin on the Pirates. I suggest everyone write down exactly how they feel about the current situation so that when March rolls around you can read what you wrote and pop the high expectations bubble that will begin to grow in the coming months and reach the "Hey, I think we have a shot at the division this year!" level around February 23rd. I refuse to get sucked in again. Then again, if LaRoche does hit like he was in the second half for the entire year...just kidding. The excellent news: The Penguins season officially kicks off on Friday. It will be nice to have 2 winning teams to write about. 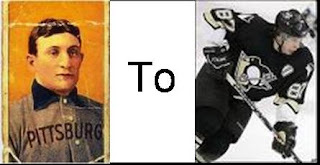 I realized this weekend that my knowledge of ancient (read pre-50s) Pittsburgh sports history is rather lacking. To remedy this and distract myself from the sad display of football this weekend, I decided to figure out what would have been the best year to be born a Pittsburgh sports fan, ranging from 1999 to 1892. You always hear about how us young people missed out in the 70s (which we did), but doesn't having the Penguins as a winning team make a difference? Or what about the consistent winning of the Steelers for the past 15 years? I wanted to know, on average, who has had the best (and easiest) years as a Pittsburgh sports fan. Since division titles are a lot less meaningful in hockey, I rewarded some extra points for long playoff runs. The system was fairly arbitrary, but I felt like it was effective. You may be thinking that the person who saw the most championships, aka someone who was born in the early 20s and saw the Pirates win their second world series and is still alive today, would have the prime birth date in terms of Pittsburgh sports. But I also figured that depending on the period of your life in which the relative successes were taking place was also a vital part of sports happiness. Having your team win 4 championships and getting plastered every time with little to no responsibility while you were in your 20s is probably a lot better than having them win those 4 championships when you have to put your kid to bed at 9 PM every night. So I factored in age as well. I assigned a point value from 0-1 for each age from 6-80 years old, with 6 being used as the first year of sports cognizance. I then multiplied this number by the number I derived for each year through the point system above. At 6 you're more concerned with idolizing the players, no matter who they are, so winning isn't nearly as important, which is why age 6 was assigned a value of 0.3. My thinking was then that a 6 year old only get 30% of the satisfaction possible from winning. From 20-30 years old I gave a value 1, because those are the prime years of sports enjoyment. It then decreased, rose again when the kids got older, and then decreased until 80. The full scale can be found after the jump, along with the point value I assigned to each year. Not surprisingly, a fan born in 1927 has the most total utility at this point. He was young enough to enjoy the 70s heyday while barely into his 50s, the resurgent point after the children are old enough to let him have his space, and old enough to appreciate the 1960 World Series, plus still be alive for the 90s and Super Bowl. The total wasn't that surprising, but the real question is which fan and era averaged the highest utility per year. The top year to be born was 1963. A person born in '63 would be 8 for the Pirates 3rd World Series, 11 and 12 for the Steelers' first 2 Super Bowls, 15 and 16 for the next 2, hit the Stanley Cups while still in his 20s, and still enjoy the 90s and '00s. Other interesting things to note: 1974 was a bad year to be born, as you really didn't get to experience the Super Bowls. After that, 1982-1985 was the last real shot to enjoy the multiple Stanley Cups and be at or near drinking age for the '05 Super Bowl. I know I made some major assumptions. The fan has to equally like all 3 sports, the model ignores past and future successes (meaning the worth we get out of having the history of the 70s is not included for the younger generation, and neither is the worth of knowing Sid will bring home 3 Cups), and my age ranking and scores incorporate a lot of subjectiveness. The year rankings also completely neglect the fact that people would want to avoid the Great Depression, Prohibition, wars, and the Mark Malone Era. So what did you think? Does 1963 sound about right, or did I place too much importance on age? I think this is more of a work in progress, so let me know if you find my logic to be either brilliant or idiotic. Also, I rushed this post (and probably the data as a whole) so let me know if I didn't explain anything well enough. The spreadsheets with the values I used for the age and year rankings can be found after the jump. -One last thing: The poll pitting the Steelers vs the Penguins will be up Wednesday morning. I am stunned by this level of research. That PSU loss must have hit you harder than I thought. Sam, I love you. RARARARARGH!! !